Since its inauguration in 1989, the McLaren AUTOSPORT BRDC Award has grown to become one of the most distinguished and illustrious accolades in global motorsport. With the aim of boosting the prospects of young British racing talent, its merit is proved in the list of past winners - which includes 2009 F1 world champion Jenson Button and four-time IndyCar champion Dario Franchitti. As this year's big reveal on Sunday 4 December draws nearer, we've taken a trawl through the video archives to bring you footage of the moment some of our most famous past winners have been announced. We'll be adding one new free video each day for the rest of the week as we build up to this year's Awards. Jenson Button, the 2009 Formula 1 world champion, won the McLaren AUTOSPORT BRDC Award in 1998 following a dominant maiden season in Formula Ford. 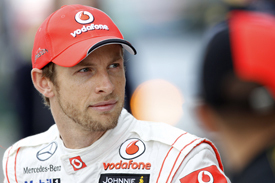 Button ended the year as champion of the British series, runner-up in the European Championship and winner of the end-of-season Formula Ford Festival at Brands Hatch. A brilliant race-winning rookie campaign in British Formula 3 the following year led to his grand prix debut in 2000. He has since made over 200 F1 starts for Williams, Benetton, Renault, BAR, Honda, Brawn and McLaren, claiming 12 wins, 43 podiums and the 2009 world title. Our third video is from last year's AUTOSPORT Awards show. Lewis Williamson won the McLaren AUTOSPORT BRDC Award following his second season in Formula Renault 2.0 UK, in which he collected five wins, five pole positions and nine podiums en route to finishing a close second in the championship. He graduated into GP3 this year and claimed a maiden win on home soil at Silverstone, and also collected podiums at Valencia and the Nurburgring. Our second video is from 2004, when Paul di Resta won the award following his campaign in Formula Renault 2.0 UK in which he finished third, with four wins, four pole positions and nine podiums to his credit. A year after winning the award he graduated into the F3 Euro Series, coming up against future Formula 1 rivals Lewis Hamilton and Adrian Sutil. One year later and he beat ASM team-mate and reigning F1 world champion Sebastian Vettel to the title. He moved into DTM in 2007 and, after winning races in 2008 and 2009, captured the title for Mercedes the following season, paving the way for his F1 bow this year with Force India. First up is Dario Franchitti, who won the award in 1992 following his exploits in Formula Vauxhall Junior and Formula Vauxhall-Lotus. He would go on to become one of the UK's most successful driver exports, and this year sealed his fourth IndyCar title. He is also a two-time winner of the Indianapolis 500, a victor in the Daytona 24 Hours, a winner of two International Touring Car races and tested for the Jaguar Formula 1 team midway through 2000.